Step 1: Set up your grill for direct grilling and preheat to medium. Step 2: Meanwhile, shuck the oysters using a shucking knife, taking care not to spill the juices. Discard the top shell and arrange the oysters in the shellfish rack. Top each with 2 teaspoons barbecue sauce, grated cheese, a sprinkle of barbecue rub, and a splash of hot sauce (if using). Step 3: Place the rack with the oysters on the grill and lower the grill lid. 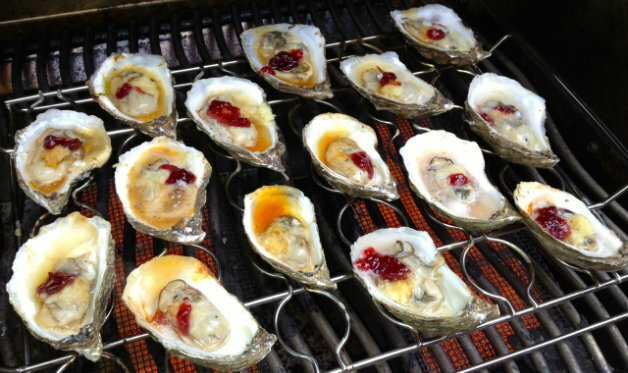 Grill the oysters until just cooked and the cheese and sauce are melted and bubbling, 3 to 5 minutes. Use the Best of Barbecue Shellfish Rack. Serve with these other appetizers for a New Year’s cocktail party hot off the grill.